Going through something traumatic such as a mugging can really bugger you up. 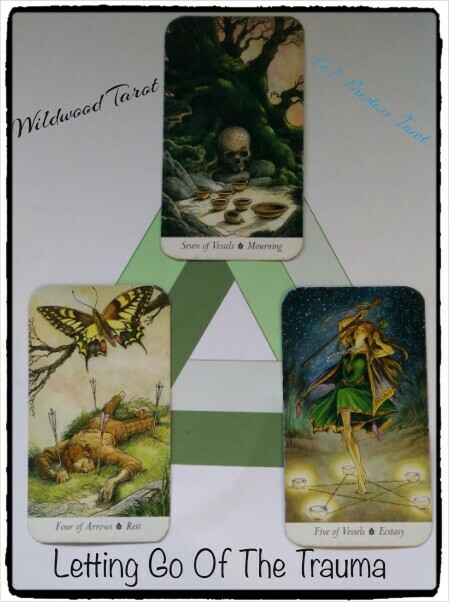 I explore ways of dealing with it & the after effects of trauma with the Tarot. Having something violently removed from you shakes you up, no matter what was removed, how it happened or where you were. Items are just that, items. When you’re physically assaulted to get that possession & you fight back, it adds to the trauma when the battle is over with, no matter how much “training” you’ve had. Trauma can last for a time, or go away quickly. Some people are great at getting back into the saddle quicker than others, to “get back to normal” & act as if it never happened. Some, play the events over & over in their heads as their brain processes the emotions & logic behind. Inevitably “shoulda, woulda, coulda” comes up pretty quick. If only I’d done X, I would have done Y & could have done Z. Well, the mind monkey’s are great at doing encores when this happens. Trauma does that, but it affects everyone in different ways. The question was: How can I cope with the trauma? Card 1 was 7 of Vessels. What is it I need to do here? Card 2 was 4 of Arrows. What is it I need to do now? Card 3 was the 5 of Vessels. What is the next step to take? The 7 of Vessels says to grieve, to let the anger & frustrations of it go. Sort it out, put it into certain vessels, deal with it in segments. I’ve got less of these than my husband, that’s for sure. He’s carrying the bruises to prove it. The 4 of Arrows says; calm down. Stop. Take stock. Given the story that my husband told the police, he’s lucky it was only a black eye. That will heal. A broken arm would be more of an issue, but the bike armour did more than its job! The 5 of Vessels is exactly what my husband is good at doing, far more than I am. When I had a serious accident (I got rear-ended in my early 20’s with bad whiplash) I wouldn’t take the car near the area the accident happened in. It took me 8 months to do that. He’s been back there within days, getting over the fear & working through it. I think he’s being very brave. It’s not a case of carrying on regardless, it’s a case of getting back into that saddle & not letting it stop us or slow us down. Slow it down, take a break, take stock, remember what is important. This past week has been traumatic for that reason & a few more (and my cat is very much alive & purring away at my side as I type) details, so I’ll be glad to see the back of this week. I’ll also be glad to see the end of April, knowing that there are various planets in retrograde during April (Venus, Mercury, Jupiter, Saturn & Pluto) it’s just going to be horrendous! Can I hide in a basement anywhere, please? I’ve used The Wildwood deck here with permission, though I wish the situation hadn’t happened; as do we all.